This very cold winter morning I discovered frost on one of my kitchen windows. We don’t usually get frost inside but I cooked a big steamy pot of soup for dinner last night and got condensation on the inside of the window. Then it got down to three degrees last night (hence the soup) and so Jack Frost came to call. 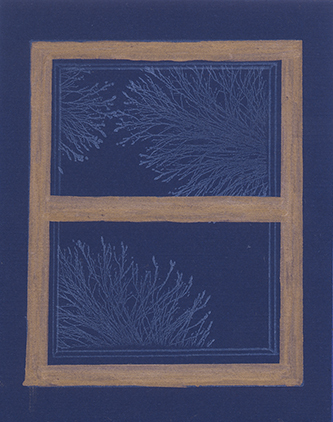 So this afternoon I was inspired to make a card showing frost on a window. This simple card took me all afternoon to get right, but I kept fiddling with it until I got it the way I envisioned it. I took a few pictures of the frost this morning so that I’d have a reference to make my stamped ‘frost’ this afternoon. I also poked around to look at frost pictures online. 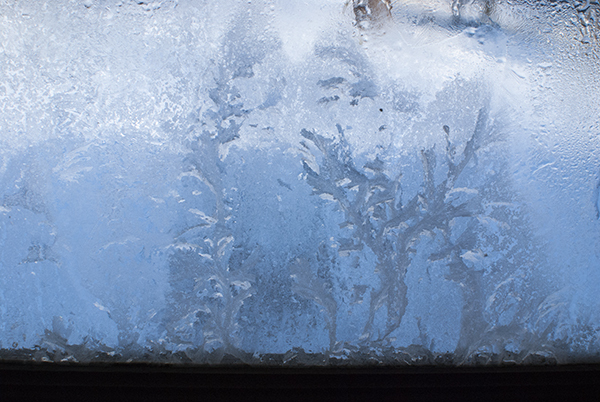 When you get frost on a window it looks a bit like a fern or coral or branches. Some frost even looks like feathers. 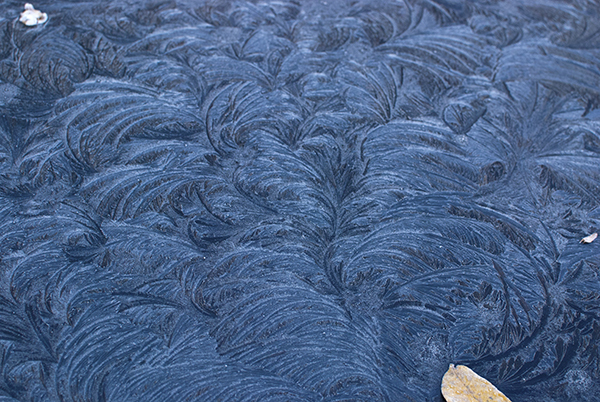 This is a picture I took of frost on my car a couple of years ago. Doesn’t it look like feathers? So to create my frost card, I pulled out possible stamps that I thought might work to look like frost. I played around with stamping them on white scrap paper with light blue ink and decided that the tree stamp at the bottom center of the above picture had the most potential. This was my first frost attempt. 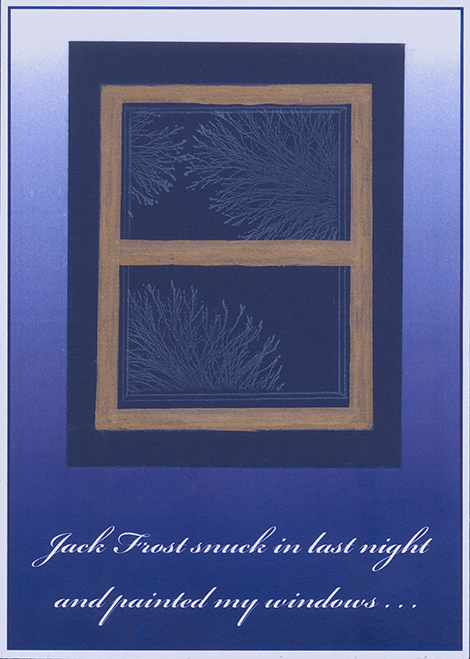 I stamped the ‘frost’ in blue archival ink on white cardstock (using a mask to protect the window frame area.) Then I colored the window panes with a light blue alcohol ink marker to both give the glass a bluish tinge and also to mute and blur the frost a bit. 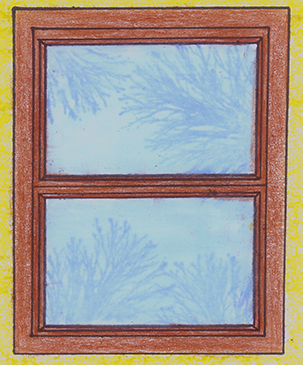 My kitchen is yellow, so first I tried coloring the ‘wall’ area on the card with a yellow colored pencil. It looked pretty boring, so I made another mask to cover the entire stamped window this time and then ran a Rollagraph pattern over the yellow background using yellow ink. That spiced things up a bit and is something I’ll keep in mind for future cards, but I still wasn’t happy with this card. It just wasn’t doing it for me. Part of my issue with it was that the frosty window was more muted than the rest of the card and I wanted the frost to be the focus. My other issue is that I didn’t like my handwritten text. My handwriting is ok, but it made the card look kind of clunky. So I started trying the stamp using different colors of ink on different colors of scrap paper. In the end, I liked ColorBox Oyster White ink on this deep blue cardstock. 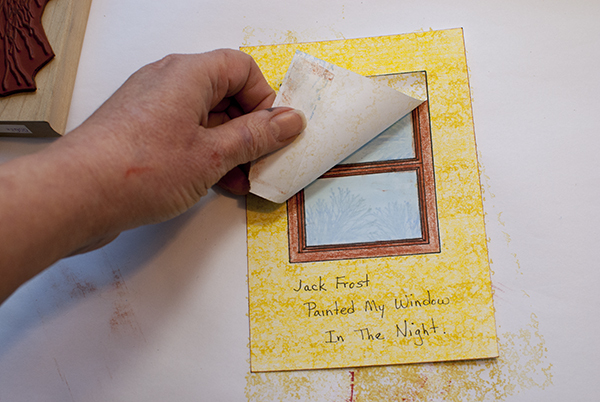 I stamped both the frame and the frost in this white ink (again masking the window frame before stamping the frost.) I colored the frame in with a copper Permapaque marker. Then I played around with some text and a white-to-blue background using my computer and printed out the background. The stamped window was layered onto the text/background layer using Xyron adhesive and then the whole thing was layered onto a white card. So in the end, it is an extremely simple card. If I had know how I was going to make it when I first began, I could have done it in twenty minutes or less. But sometimes cards don’t just magically work on the first try. Sometimes you have to keep at them until you have something that you like. 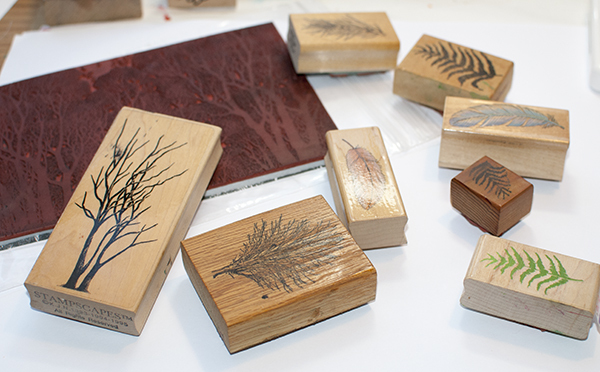 And that is ok, because along the way, you learn things about your stamps and about ways the mediums you have work (or don’t work together.) So it is all good. For more ideas on ways to create the look of snow or ice in a stamped card, see my free eArticle, “Snow & Ice Techniques For Stampers”. Great idea Nancie – It really does look like frost! You are so clever! I agree with you that the first card always takes sooooo long. Because of that, I usually make several more – all the hard work was done with the first one.